Today I want to discuss a slightly more advanced topic which I will not be able to explain in much detail, but goes by the name of the gauge Hierarchy problem or just the `the Hierarchy Problem‘. My main motivation is to simply make you curious enough that you will feel inspired to investigate it further for yourself since it is one of the outstanding problems in particle physics and one of the main motivations for the construction of the LHC. A second motivation is to bring to your attention a recent and exciting paper which proposes a potentially new solution to the hierarchy problem. The hierarchy problem can roughly be stated as the problem of why the vacuum expectation value (VEV) of the Higgs boson, which determines the masses of the electroweak W and Z bosons, is so small compared to the highest energy scales thought to exist in the Universe. More specifically, the masses of the W and Z bosons (which define the weak scale) are roughly GeV (see Figure 1) in particle physics units (remember in these units mass = energy!). 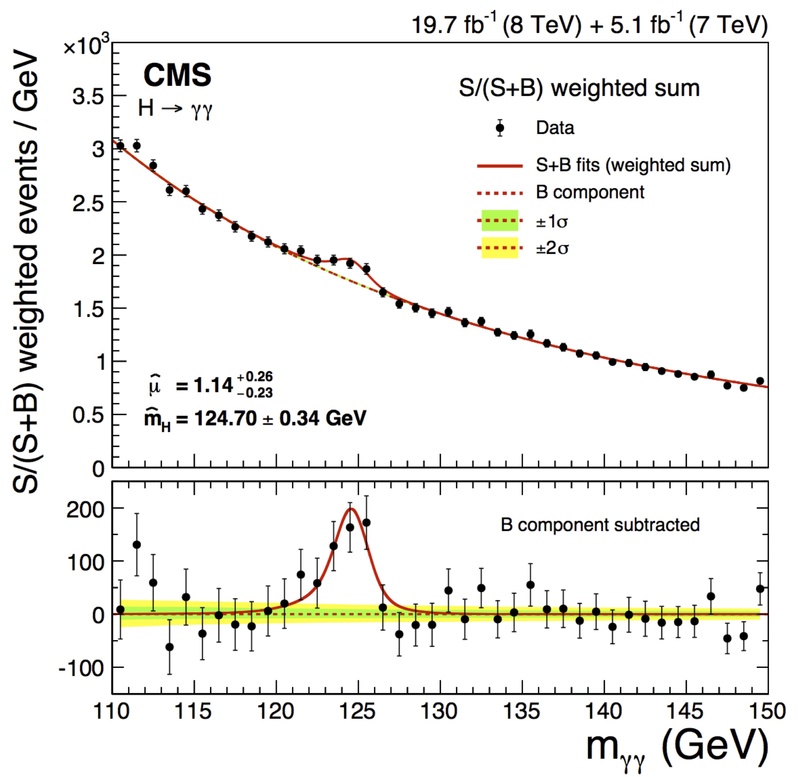 The W boson as it finds to its astonishment that it has a mass of only about 100 GeV instead of GeV as expected. On the other hand the highest energy scale thought to exist in the Universe is the planck scale at GeV which is associated with the physics of gravity. 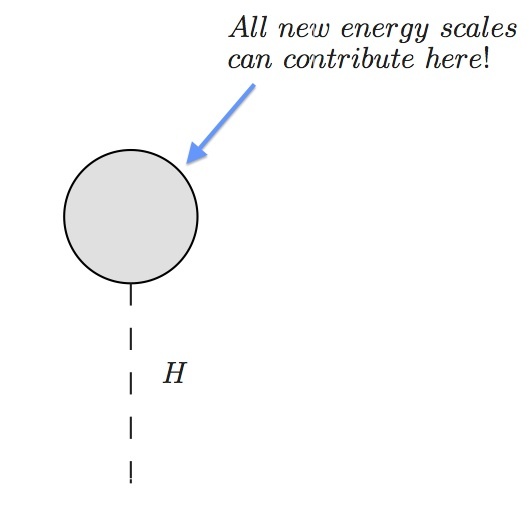 Quantum field theory tells us that the Higgs VEV should get contributions from all energy scales (see Figure 2) so the question is why is the Higgs VEV, and thus the W and Z boson masses, a factor of roughly smaller than it should be? The Higgs vacuum expectation value receives contributions from all energy scales. In the Standard Model (SM) there is no solution to this problem. Instead one must rely on a spectacularly miraculous numerical cancellation among the parameters of the SM Lagrangian. Miraculous numerical `coincidences’ like this make us physicists feel uncomfortable to the point that we give it the special name of `fine tuning’. The hierarchy problem is thus also known as the fine tuning problem. A search for a solution to this problem has been at the forefront of particle physics for close to 40 years. It is the aversion to fine tuning which leads most physicist to believe there must be new physics beyond the SM whose dynamics are responsible for keeping the Higgs VEV small. Proposals include supersymmetry, composite Higgs models, extra dimensions, as well as invoking the anthropic principle in the context of a multiverse. In many cases, these solutions require a variety of new particles at energies close to the weak scale ( GeV) and thus should be observable at the LHC. However the lack of evidence at the LHC for any physics beyond the SM is already bringing tension to many of these solutions. A solution which does not require new particles at the weak scale would thus be very attractive. Recently a novel mechanism, which goes by the name of , has been proposed which potentially offers such a solution. The details (which physicists are currently still digesting) are well beyond the scope of this blog. I will just mention that the mechanism incorporates two previously proposed mechanisms known as inflation and the QCD axion which solve other known problems. These are combined with the SM in a novel way such that the weak scale can arise naturally in our universe without any fine tuning and without new particles at the weak scale (or multiple universes)! And as a bonus, the axion in this mechanism (referred to as the `relaxion’) makes a good dark matter candidate! Whether or not this mechanism turns out to be a solution to the hierarchy problem will of course require experimental tests and further theoretical scrutiny, but its a fascinating idea which combines aspects of quantum field theory and general relativity so I hope it will serve as motivation for you to begin learning more about these subjects! 1. Inflation is a theorized period of exponential accelerated expansion of our Universe in the moments just after the big bang. It was proposed as a solution to the problems of why our Universe is so flat and (mostly) homogenous while also explaining the structure we see throughout the Universe and in the cosmic microwave background. 2. Axions are particles proposed to explain why the amount of CP violation in the QCD sector in the SM is so small, which is known as the `strong CP problem‘. 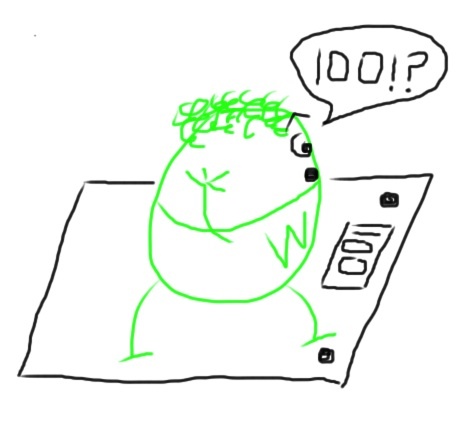 Figure 1: Monsieur Higgs boson hiding behind a background. Last time I discussed the Higgs boson decay into photons, i.e. `shining light on the Higgs boson‘. This is a followup discussing more generally the problem of uncovering a Higgs boson which is hiding buried behind what can often be a large background (see Figure 1). 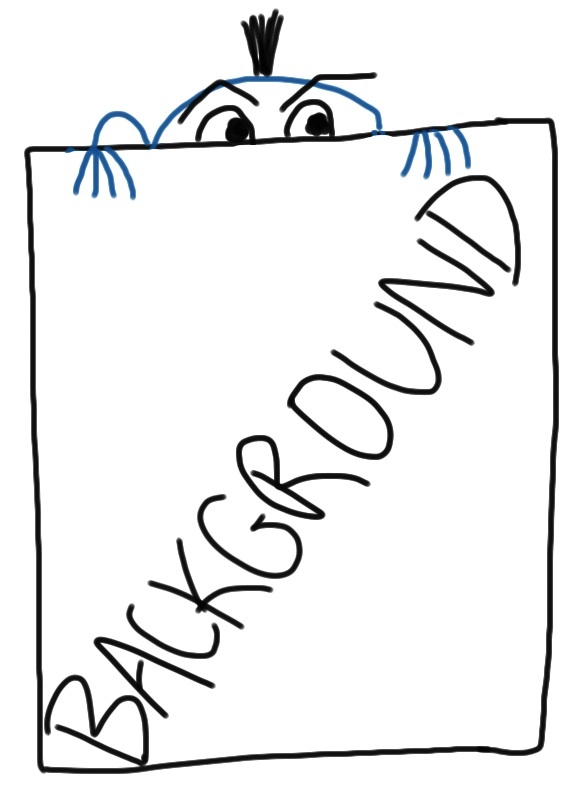 Perhaps the first question to ask is, what the heck is a background? Well, basically a background is anything that we `already know about’. In this case, this means the well understood Standard Model (SM) processes which do not involve a Higgs boson (which in this case is our `signal’), but can nevertheless mimic one of the possible decays of the Higgs. For most of these processes, we have very precise theoretical predictions in addition to previous experimental data from the LEP and Tevatron experiments (and others) which previously searched for the Higgs boson. So it is in reference to these non-Higgs SM processes when we use the term `background’. As discussed in my previous post, the Higgs can decay to a variety of combinations of SM particles, which we call `channels’. Each of these channels has its own corresponding background which obscures the presence of a Higgs. For some channels the backgrounds are huge. 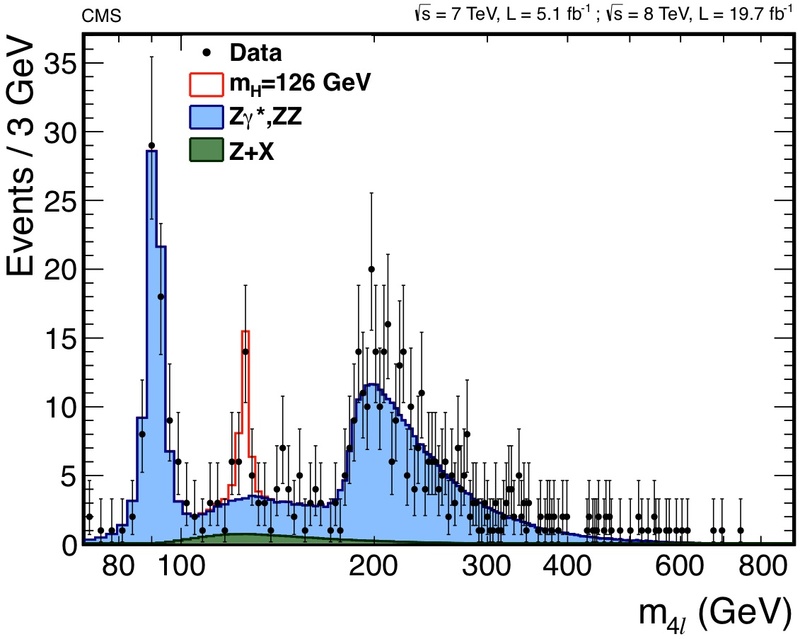 For instance the background for a Higgs decaying to a pair of bottom quarks is so large (due to QCD) that, despite the fact this is the dominant decay channel (about 60% of Higgs’ decay to bottom quarks at 125 GeV), this channel has yet to be observed. This is in contrast to the Higgs decay to four charged leptons (specifically electrons and muons) channel. This decay (mediated by a pair of virtual Z bosons) was one of the first discovery channels of the Higgs at the LHC despite the fact that roughly only one in every 10,000 Higgs bosons decays to four charge leptons. This is because this channel has a small background and is measured with very high precision. This high precision allows LHC experiments to scan over a range of energies in very small increments or `windows’. Since the background is very small, the probability of observing a background event in any given window is tiny. Thus, if an excess of events is seen in a particular window, this is an indication that there is a non background process occurring at that particular energy. Figure 2: The energy spectrum of a Higgs decaying to four charged leptons (red) and its associated background (blue). This is how the Higgs was discovered in the decay to four charged leptons at around 125 GeV. This can be seen in Figure 2 where in the window around the Higgs signal (shown in red) we see the background (shown in blue) is very small. Thus, once about a dozen events were observed at around 125 GeV, this was already enough evidence for experiments at the LHC to be able to claim discovery of the long sought after monsieur Higgs boson. 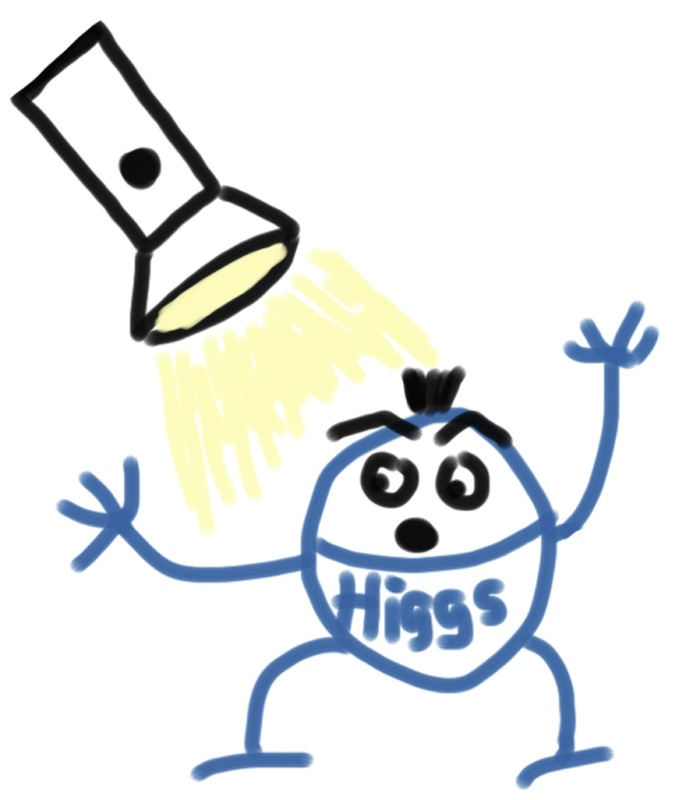 Figure 1: Here we give a depiction of shining light on monsieur Higgs boson as well as demonstrate the extent of my french. This is my first Particlebites entry (and first ever attempt at a blog!) so you will have to bear with me =). As I am sure you know by now, the Higgs boson has been discovered at the Large Hadron Collider (LHC). As you also may know, `discovering’ a Higgs boson is not so easy since a Higgs doesn’t just `sit there’ in a detector. Once it is produced at the LHC it very quickly decays (in about seconds) into other particles of the Standard Model. For us to `see’ it we must detect these particles into which decays. The decay I want to focus on here is the Higgs boson decay to a pair of photons, which are the spin-1 particles which make up light and mediate the electromagnetic force. By studying its decays to photons we are literally shining light on the Higgs boson (see Figure 1)! The decay to photons is one of the Higgs’ most precisely measured decay channels. Thus, even though the Higgs only decays to photons about 0.2 % of the time, this was nevertheless one of the first channels the Higgs was discovered in at the LHC. Of course other processes (which we call backgrounds) in the Standard Model can mimic the decays of a Higgs boson, so to see the Higgs we have to look for `bumps’ over these backgrounds (see Figure 2). By carefully reconstructing this `bump’, the Higgs decays to photons also allows us to reconstruct the Higgs mass (about 125 GeV in particle physics units or about kg in `real world’ units). Figure 2: Here we show the Higgs `bump’ in the invariant mass spectrum of the Higgs decay to a pair of photons. Furthermore, using arguments based on angular momentum the Higgs decay to photons also allows us to determine that the Higgs boson must be a spin-0 particle which we call a scalar . So we see that just in this one decay channel a great deal of information about the Higgs boson can be inferred. Now I know what you’re thinking…But photons only `talk to’ particles which carry electric charge and the Higgs is electrically neutral!! And even crazier, the Higgs only `talks to’ particles with mass and photons are massless!!! This is blasphemy!!! What sort of voodoo magic is occurring here which allows the Higgs boson to decay to photons? The resolution of this puzzle lies in the subtle properties of quantum field theory. More specifically the Higgs can decay to photons via electrically charged `virtual particles‘ . For present purposes its enough to say (with a little hand-waiving) that since the Higgs can talk to the massive electrically charged particles in the Standard Model, like the W boson or top quark, which in turn can `talk to’ photons, this allows the Higgs to indirectly interact with photons despite the fact that they are massless and the Higgs is neutral. In fact any charged and massive particles which exist will in principle contribute to the indirect interaction between the Higgs boson and photons. Crucially this includes even charged particles which may exist beyond the Standard Model and which have yet to be discovered due to their large mass. The sum total of these contributions from all possible charged and massive particles which contribute to the Higgs decay to photons is represented by the `blob’ in Figure 3. 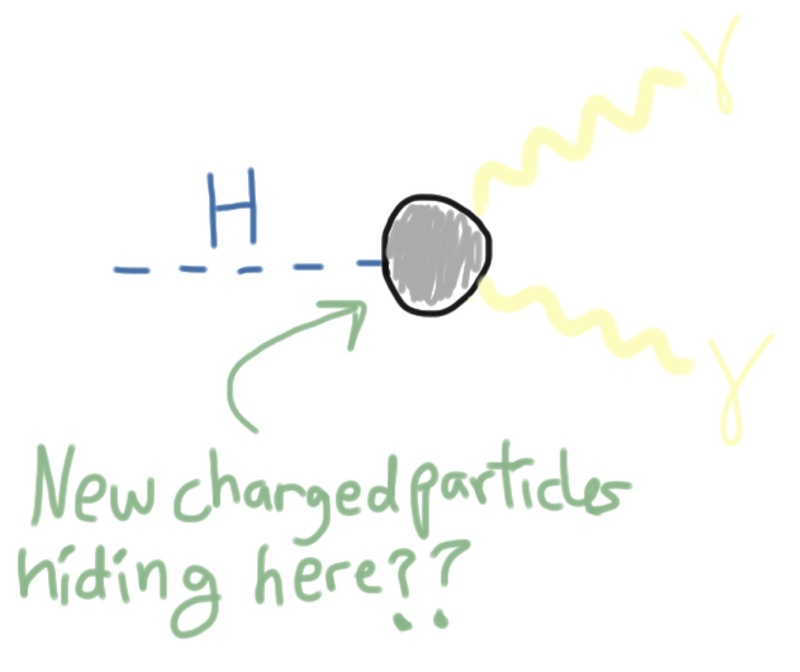 Figure 3: Here we show how the Higgs decays to a pair of photons via `virtual charged particles’ (or more accurately disturbances in the quantum fields associated with these charge particles) represented by the grey`blob’. It is exciting and interesting to think that new exotic charged particles could be hiding in the `blob’ which creates this interaction between the Higgs boson and photons. These particles might be associated with supersymmetry, extra dimensions, or a host of other exciting possibilities. So while it remains to be seen which, if any, of the beyond the Standard Model possibilities (please let there be something!) the LHC will uncover, it is fascinating to think about what can be learned by shining a little light on the Higgs boson! 1. There is a possible exception to this if the Higgs is a spin-2 particle, but various theoretical arguments as well as other Higgs data make this scenario highly unlikely. 2. Note, virtual particle is unfortunately a misleading term since these are not really particles at all (really they are disturbances in their associated quantum fields), but I will avoid going down this rabbit hole for the time being and save it for a later post. See the previous `virtual particles’ link for a great and more in-depth discussion which takes you a little deeper into the rabbit hole.